With this book of lies (Crippled Immortals by Mr. Chris Murray) being put into the public domain, we cannot stand by and say nothing. The tarnishing of the integrity and good name of the late Shizu Xu Jin Dong’s (also referred to as Grandmaster Chee Kim Thong), affects his family and students whom all teach to keep the arts alive and to pass on the health benefits and morals to others. 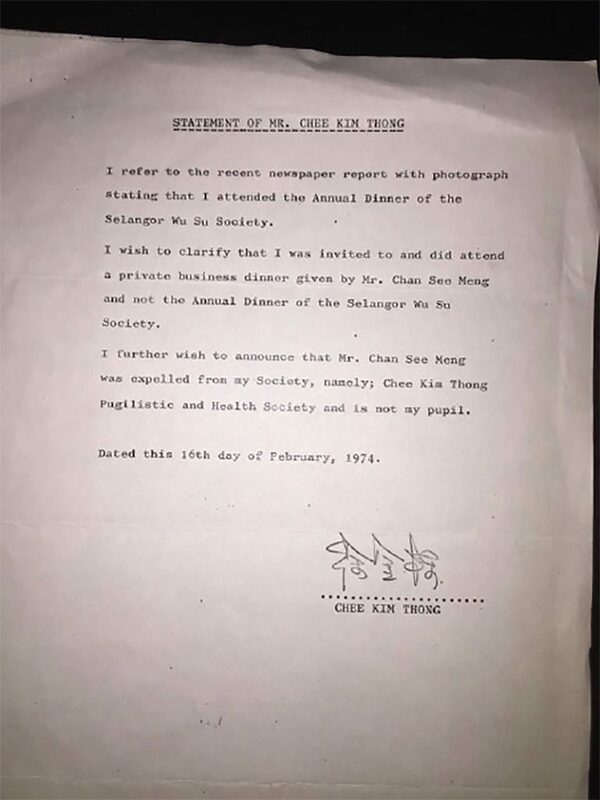 It’s very disrespectful to the deceased, for Mr. Chan See Ming to use his student to make these unsubstantiated accusations against Shizu Xu Jin Dong, the late Master Yap Cheng Hai and Mr. Lum Koon Hoong. Mr. Chris Murray’s book uses biased and offensive nicknames to refer to people whom he has never even spoken to. Many have recently passed away and cannot defend this slander directly. Mr. Chan See Ming should know better; to never laugh or ridicule the deceased. You should always pray and hope they have a smooth journey in the next life. Some people say Mr. Chan See Ming’s recent stroke and ill health is caused by this bad karma and disrespect for his former Master. Mr. Chan See Ming would want you to think he is putting the ‘cat amongst the pigeons’ to expose the bad treatment he has suffered when in reality this is all of his own doing. Before blaming others he should take a good look in the mirror. The reality is Mr. Chan was only taught 3 forms and expelled by Shizu Xu Jin Dong in 1974; still a young in-experienced student. A photograph of the signed document is attached. Mr. Chan’s tantrums and false claims have been ignored and tolerated by members of the association for many years. Our school only teaches Wuzuquan, Wujiquan and the Luohan Ru Yi Quan. 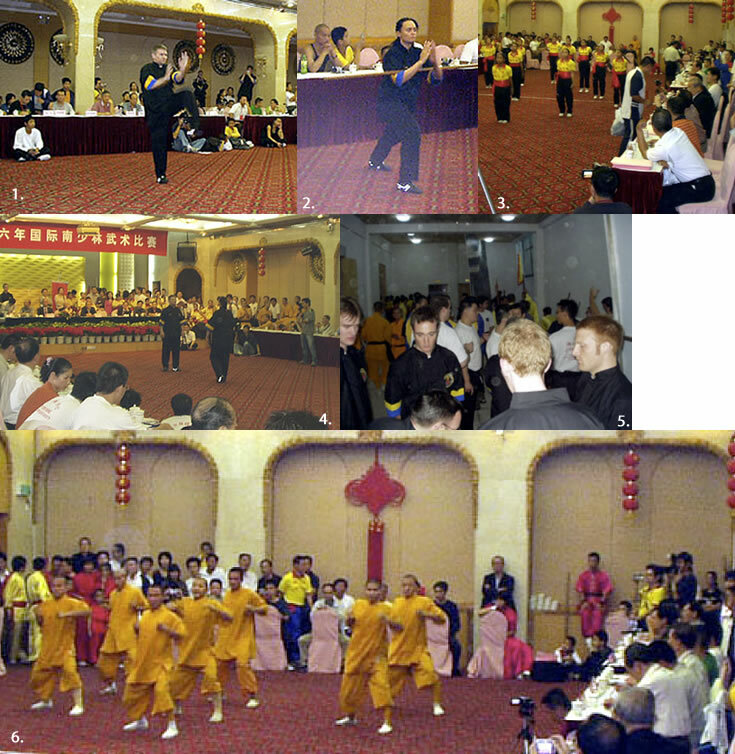 The Luohan Ru Yi Quan was not taught to Mr. Chan by Shizu Xu Jin Dong as claimed in Chris Murray’s book but shown to him by the late Mah Chai Soon and another student in Sydney Australia. He claims that the association uses his name to promote the school when he won the middleweight division of the South East Asia Open Invitation tournament in Singapore 1969. All the members are patiently waiting for this evidence to be produced, but again nothing exists to support these claims. The Southern Wuzuquan Union is one of the organizations recognized by China’s National Sports Council. The others are the International Wushu Association, the Taiji Association, and the Southern Fists Association. They are granted the authority to grade anyone who has the martial arts caliber to receive recognition. Mr. Chan doesn’t have to boast how good he is. Let others be the judge. If Mr. Chan feels bitter that he has not received enough accolades to show for his abilities, then why doesn’t he go to one of these events and prove he is worthy? He might think he is a senior, but does he have the skills and qualifications to support this? Shizu Xu Jin Dong taught hundreds of students; not just the fictitious “inner 5 disciples”. The ‘inner 5 disciples’ is another term that has been completely fabricated to trick students into believing Mr. Chan has acquired ‘secret’ knowledge that no other students or disciples were taught. Would a true master show such favoritism or devotion to a single student? Whilst all the students are precious to the master, the master will teach a student to his/her ability; the Master does not show favoritism. If the Master wants to teach, he will teach. You don’t get to choose or ask what you want to learn. If the Master feels you are worthy and are of good moral character and ability, then he will teach the student, safe in the knowledge he/she will respect these teachings and will not abuse this skill for personal, or financial gain. Mr. Chan would want you to believe he is so special, but really? What has he done to support the association? A lifetime in banking and cannot come up with any fundraising ideas, nor put hands in his own pockets to make any investment to improve things? The truth of the matter is Mr. Chan See Ming was never, nor has ever been a favorite student of Xu Jin Dong. Shizu Xu Jin Dong expelled Mr. Chan for teaching without permission; plain and simple. Have you ever heard of a Master taking back a student when he has undermined the master’s trust with dishonesty and lies? Shortly after Shizu Xu funeral, the late Master Yap Cheng Hai called a meeting with the disciples. Mr. Chan See Ming was present at this meeting. Master Yap asked if anyone has got anything to say or to contribute for the future of the club. No one came forward. A few months later, Mr. Chan See Ming claimed he got a letter from Shizu Xu Jin Dong citing him as the successor to the school. If this was true this would not be a problem and therefore, to support his claim, he was asked to produce the letter as confirmation. To date, no letter has ever been produced; not even a photocopy. Mr. Chan then claimed the letter was put into Shizu’s drawer in his office; for safe keeping. Shizu Xu’s office was a fortress; like Fort Knox. It would be very difficult for anyone to have access to any of his belongings, for a letter to go missing. For such an important document, you would have thought this would have been sighted, witnessed, or signed by third parties to support its credibility. Would any Master really grant the title of successor to the art to someone with these corrupt morals? Who is so underhanded and devious? Someone who would tarnish the reputations of the deceased for their own personal, or financial gain? It is worth stating for the record that others with more to contribute to the school than Mr. Chan have declined the responsibility to lead the school. I would also ask Mr. Murray if he walked into the Southern Shaolin Temple un-invited and asked to see the Abbot would he receive an audience? Mr. Chan See Ming claimed he taught in the Shaolin Temple, so by now, Mr. Murray should realize the truth. This is complete fiction. How can Mr. Murray or Mr. Chan criticize Shaolin, the Abbot, and the monks when their own knowledge of Chinese Martial arts or even basic etiquette and manners is so limited? Mr. Chris Murray’s (Ph.D.) book is a poor, vain and bitter last ditched attempt to lay claim for his ‘Master’ a title that he was never worthy of. Mr. Chan wishes to use Shizu Xu’s good name for his own financial benefit, rather than ensuring the art is preserved for future generations. Committing these lies and mistruths to paper only shows Dr. Murray’s gullibility and exposes his master’s true intentions; working the strings in the background. To gain a postgraduate doctoral degree normally requires years of in-depth study and the ability to check facts and sources very methodically. Blind obedience and no common sense seem to have taken priority here. The book spins a web of lies all under the pretense of providing a factual insight into Shizu Xu’s life and the history of the school. It’s not too difficult to gather from the book that Mr. Chan’s real intention is just for his own personal benefit. If Mr. Chan really understood traditional Martial Arts, he would adhere to the association’s tenets; such as honesty, humility, and respect. Grand Master Chee would have preferred for his students to unite as a family and contribute to the greater good of our great lineage of martial arts. At the end of the day, surely a book promoting and showing what he has learned, if anything, would have benefited the art far more than using a student to lie on his behalf, especially when he has been shown so much generosity from the Master and fellow students that he criticizes. Such a shame Mr. Chan and his student’s motives for this book are not honorable. I hope anyone who reads this book has the opportunity and common sense to see this for what it is. Welcome to the Official website of the International Nan Shaolin Wuzuquan (Chee Kim Thong) school in Europe. This website aims to promote the traditional system of Chinese Martial Arts as taught by Grandmaster Xu Jin Dong (Chee Kim Thong) and his disciple Grandmaster Han Jin Yuan. Grandmaster Han is a 10th Dan Level of the Chee Kim Thong branch of Nan Shaolin Wuzuquan (South Shaolin 5 Ancestors Fist). He is the only senior master in Europe and is authorised by the International Wuzuquan Union in China. We have an active Facebook group which you can visit by clicking here. If you are a senior student of Grandmaster Han, you can also join a closed Facebook group by clicking here. Below is a link to the letter of invitation from China to attend the cultural event in 2010 and the role the Chinese government had in acknowledging that Wuzuquan is a cultural heritage martial art recognised by them along with Wushu and Taiji. 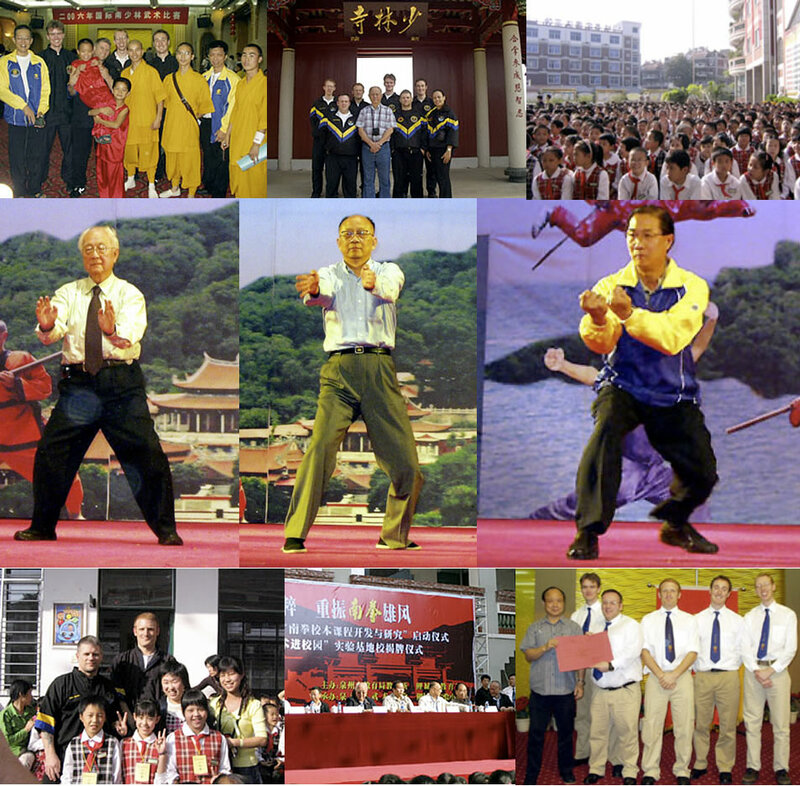 The renowned Grand Master Kim Han, President of the International Nan Shaolin Wuzu Quan Union led the English and Irish Teams to the Annual Nan Shaolin Wuzu Quan Championships in Quanzhou, Fujian Province, Southern China in November 2006. Grand Master Han is responsible for Wuzu in Europe and lives in North London. He hails from the Malaysian Shizu Chee Kim Thong school of Nan Shaolin Wuzu Quan (Kuala Lumpur). He is the author of the published book one, ‘Fundamentals of Nan Shaolin Wuzu Quan’. Book two of nine is already completed and awaiting publication. 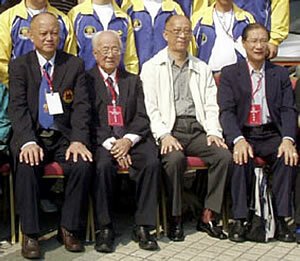 The two-year Presidency held by Grand Master Han was due to be handed over at a ceremony held after the competition. The next President would be the Deputy Mayor of Quanzhou, a Master in his own right. China (included; The Southern Shaolin Temple students and other regional clubs), Malaysia, Philippines (two organisations and their teams), Singapore, Hong Kong, Taiwan, Australia, England, Southern Ireland and Japan. The picture opposite shows a group photograph being assembled outside the Overseas Hotel, Quanzhou. There were several hundred competitors and officials present. Local press and television stations were present. The ‘Europeans’ attracted a lot of interest from the media. On the evening before the competition, some representatives of the Teams were requested to attend a pre-competition meeting in one of the hotel conference rooms. Grand Master Han, Myles, Tracy and Nigel went along to the meeting. Unfortunately, with the exception of Grand Master Han, a lack of understanding of the Mandarin language meant that the majority of the meeting went ‘right over our heads’. Much appreciated help from the Malaysian Team representatives provided us with a clearer understanding of the proceedings. The competition rules formulated by Grand Master Han, for the marking of ‘traditional’ events, were to be adopted for the competition. As this was a traditional competition it was to be scored differently to the International Wushu competitions we had previously gained much experience by competing in. Grand Master Han took us through the rules, judging, appeals, running order, registration, etc. these were explained to us personally and in more detail after the meeting. The competition, held at the Overseas Hotel, Quanzhou, opened the following morning at around 8:30am. The first event was the Ladies Hand Form Categories. Following some confusion with registration, Tracy was the first to ‘take the floor’ from the Anglo-Irish contingent. It is fair to say that, due to everything being conducted in Mandarin, without the help of our friends on the Malaysian Team we would not have had much idea of what was going on. Many thanks Bo, Boon and Chong. Over the next two days we were called up to our events while Grand Master Han was present on the ‘top-table’ with other notable masters, overseeing the event (please see the medal table below). The Irish Team was competing for the first time. They took 6 silver medal positions and gained valuable experience for the next time. They are certainly looking forward to ‘having another go’. Well done. There were many excellent competitors and teams at the competition. They were friendly, helpful and the competitor atmosphere was very good. The Philippine children performed an excellent innovative, musical group form that made everyone clap their performance and enthusiasm. The eagerly awaited Southern Shaolin Temple Students performed to their expected high standard with individual and group forms showing clarity and precision. Nigel and Tracy Gilham were presented with a statue of Damo at the evenings presentation ceremony as a distinction for their successes. The Irish Team received their well earnt certificates. It is worth noting that the rules adopted for this competition provided for a smooth, well run event. The organisers are going to present these rules to the Chinese Wu Shu Association in Beijing for the purpose of using them in further international competition possibly in 2008. Nan Shaolin Temple, Quanzhou, Fujian Province, Southern China. Southern (Nan) Shaolin Kung Fu originated in Quanzhou, Fujian Province. A Southern Shaolin Temple and a Southern Shaolin Museum can be found there. The monk Zhikong, who had moved here from the Songshan Shaolin Temple up north, originally built the Southern Shaolin Temple at Quanzhou in the early Tang Dynasty. The temple had its ups and downs and eventually was totally destroyed in 1763 A.D. The Shaolin tradition continued to be taught in Congfu Temple, but now that so many people worldwide are studying the many styles of Kung Fu, the Shaolin Temple was recently rebuilt. Each year, thousands of Kung Fu enthusiasts make pilgrimages to this Mecca for martial arts enthusiasts and also visit the local martial arts schools. Following the competition all of the teams went to the Southern Shaolin Temple to demonstrate before the assembled audience, some of their medal winning routines. We were also treated to various demonstrations by some of the Masters that had been officiating at the competition. The hand over of the International Nan Shaolin Wuzu Quan Union Presidency took place at a prestigious Wushu school in Quanzhou, specialising in the Southern Martial Arts. Hundreds of children from the school were present and provided some of the demonstrations that marked the handing over ceremony. The school teaches an academic syllabus around the physical education of the Wushu. Places in this school are highly sought after, as parents are keen for their children to be educated within the martial arts self-discipline system, i.e. Strength, physical and mental. The whole event, competition and post competition tour was without doubt an experience of a lifetime. Many thanks must be given to Grand Master Han, Myles Behan (for organising our itinerary), the other members of the Anglo-Irish contingent, ALL of the other competitors, the competition organisers and judges. Further competitions are planned with the main one being held in 2008. Plans are afoot to attend this prestigious event with the significance of the Olympics being present. The opportunity to compete is open to all who wish to train for it!